Hanging out with penguins is a lot like hanging out with strippers. They can touch you, but you can’t touch them. Staying five meters away from thousands of penguins proved difficult. After climbing out of the boat, we weren’t quite sure what to do with our life jackets—two penguins hopped aboard the Zodiac and climbed into the large storage container before we had a chance to put our gear in it. I made my way to an empty plot of snow and sat down. Immediately, four curious chicks—each sporting a different fluffy hairstyle—began waddling my way. Within thirty seconds of sitting down, I was surrounded by penguins who were bobbing their heads to get a better look at me, and pecking at my waterproof pants and boots. I started laughing, and I couldn’t stop. I was in Antarctica, being nibbled by baby penguins. It doesn’t get better than this, I thought. I decided go to Antarctica for the same reason most visitors want to go: to visit that elusive seventh continent, to put my feet on land that comparatively few travelers get to see. Getting to this faraway land is very expensive; you need an abundance of time and money to make such a journey. The average price for a bed in a shared cabin for a 10-day cruise to Antarctica is $10,000. Factor in flights from your local airport the embarkation port of Ushuaia, Argentina — the southernmost city on the globe and thus nicknamed “The End of the World” — and even the hardiest of travelers might consider skipping the White Continent. Not me. I had the time (my hospital job was part-time and flexible) and the money (no kids, no mortgage, no student loans, no debt of any kind, and decent savings). My situation was fortunate and I was at the right stage in my life for such a journey. I felt that if I didn’t go now, I might miss my window. So I went. I traveled for thirty-eight hours to get to Ushuaia, explored the tip of South America by myself for three days, boarded a small cruise ship, and endured two days on the treacherous Drake Passage to get to a different kind of promised land. There was an abundance of caution about corrupting the landscape: We had our belongings vacuumed for seeds. If you had to go to the bathroom, you got back on the boat. Each day we would step in a decontamination solution both when leaving the boat and when coming back on. This was just a thing we did, I thought, until it hit me why we were doing these things: Antarctica is the final frontier, the closest we have to an untouched land, and our presence could spoil it. Antarctica’s visitors may be vigilant, but humans have nonetheless affected this otherwise pristine landscape. Climate change has altered the environment: the glaciers are thinning and sea levels are rising. Warming waters are bringing in invasive species. Two weeks after I left, the area of Antarctica I visited hit a record temperature of 63 degrees Fahrenheit. There’s controversy about whether we should even allow tourists in Antarctica. Recent estimates say that about 35,000 people visit the region each year; that number is on a slow but steady uptick. I do hope people can see the land I saw, where animals are completely unafraid of people because they have no reason to be. I just don’t know what will come first: the tourist demand that will weaken Antarctica’s strict environmental protocols, or invasive king crabs that wipe out Antarctica’s fragile ecosystem. But a sinking feeling in my gut tells me we’ll be facing one or both. In Pleneau Bay, we cruised in zodiacs around six-story icebergs. It was the only day we were blessed with sun; the ice glowed blue, as if it were powered by LED. As we passed, leopard and crabeater seals lazed, giving us a once-over before returning to their naps. We went in search of whales around Enterprise Island. We found them in every direction, and we followed one pair of humpbacks that were feeding. They would swim in a spiral of bubbles, forcing the krill to the surface, and then make a dramatic lunge with jaws wide open. Sometimes these whales would surface a mere ten meters from our zodiac. Our veteran guide said he’d only seen this twice before. Portal Point was where we finally placed our feet on the continental mass of Antarctica. We hiked on top of a glacier that proved both stunning and dangerous. The guides painstakingly create safe hiking routes for passengers, but one man took it upon himself to wander off-course, a choice that sent him plummeting down a 24-foot crevasse. I’m not sure what was more dramatic: seeing someone fall into a glacier or watching the skill and professionalism of our guides in rescuing him. An hour later, he was able to walk back to shore with just a couple bruises. In Neko Harbour, the huge Gentoo penguin colony engulfed us; we were lucky to maintain five feet’s distance from the hoards of birds, let alone five meters. The squawking was deafening (I’m pretty sure we arrived during dinnertime). A hike up a steep hill offered the perfect view to watch one of the most active glaciers on the Antarctic Peninsula—it calved four times while we were there. The sight was exciting, but also unsettling: those glaciers are receding because of climate change. They’re receding because of us. Now that I’m home, I have a little Antarctica-shaped hole in my heart filled with equal parts wonder and concern. As one of my guides told me, “If you think about the definition of paradise, an untouched, wild, natural place, I think it’s here. 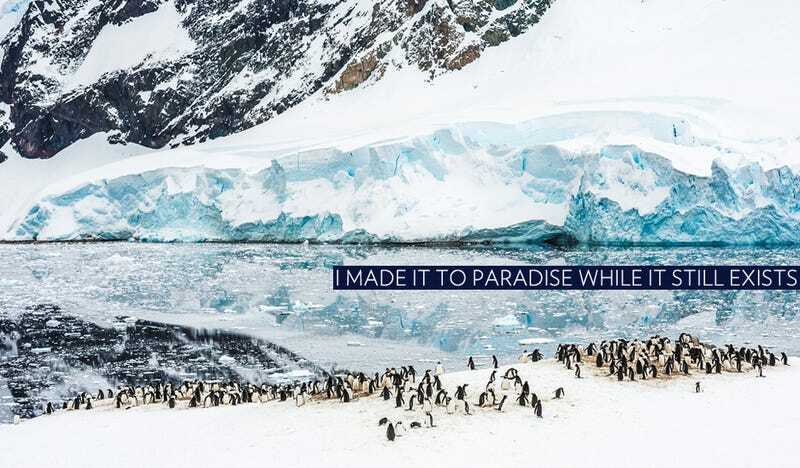 Antarctica is paradise.” I made it to paradise while it still exists. But the human footprint is inescapable. The time to visit Antarctica is now, if you can, before the changes are too great. Okay, nothing about this trip is objectively cheap. The experiences I had in Antarctica are priceless, but I had to pay a lot of money to get there. But with a lot of planning and a large dose of luck, I was able to go for about half the cost of the average passenger. If you’re a baller and want to live it up, by all means—it’s a lot easier. Scan a site like Polar Cruises, find an expedition, and pick the nicest cabin during the best time of year… and expect to pay between $10,000 and $25,000 per passenger. This is recommended for people with lots of money and maybe less time to deal with planning. For the rest of us plebs, here’s how I did it: At the last possible minute, when the real deals pop up. I booked my heavily discounted cruise to Antarctica two weeks before it left, sitting in my bedroom surrounded by Amazon Prime boxes filled with Antarctica-specific purchases that I bought without even knowing if I would actually make it to Antarctica. But once I learned about the existence of last-minute deals (discounts of 25-50% when purchased one day to one month before the ship departs), I became obsessed with getting one. Signed up for the mailing list of every Ushuaia tour agent I could find. Followed these same tour agents on Facebook. Changed my Facebook notifications so I would be alerted every time they updated their pages and carried my phone with me everywhere — the bathroom, the bed, the gym. Figured out when multiple boats were leaving within a short time period and took off three weeks’ work to cover this time period. I had five boats leaving all around the same time. Checked every major departure city on North America to find the cheapest flights to Ushuaia; I saved about $400 by buying a flight from New York and a separate flight from my hometown to NYC. Booked my flight to land in Ushuaia the day before the first boat left and depart the day the last boat got in. Worked almost every day the month before this vacation period so I wouldn’t exhaust my time off. Checked Polar Cruises on a daily basis to check the availability of the five boats I was watching. Four were sold out six weeks before I planned to leave. Booked a hostel room in Ushuaia around this last unsold ship and moved my flight home to follow the ship’s return to Ushuaia. Terrorized my boyfriend, mother, friends, and co-workers with the worries that come with waiting for a last-minute deal that may not even materialize. Made horrendous noises when the deal actually showed up. Practically threw my credit card to Ushuaia and booked the trip. Not cheap, especially since I’d wanted to spend between $4000-5000. The lowest priced last-minute deal I saw was $4500 and I’m fairly sure I saw them all. The ship I took had cruised the same route the month before, and my same cabin had costed $10,100. They discounted that room to $5000 as well. So I didn’t get the biggest sale of the season, but I did get a major discount. Rachel J. Anderson lives in Minneapolis and works part-time to fuel her wanderlust. She blogs about travel at The Joggernaut; follow her on Instagram at rachelsnackmaster.